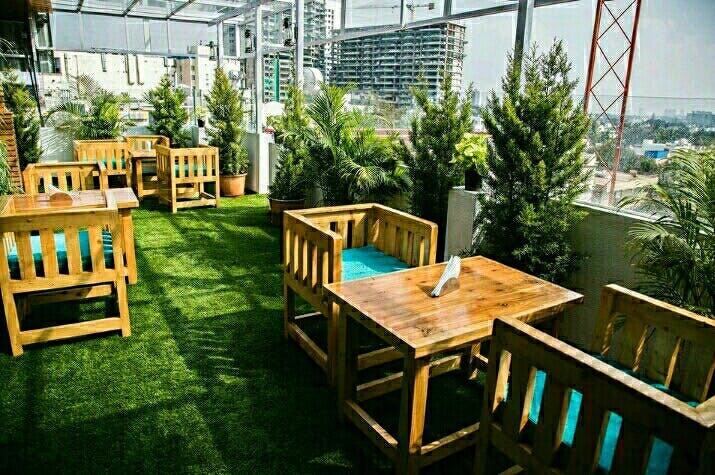 A rooftop environment with some decent music in the background helps you spend a lovely day or an evening with your squads. D View cafe is a beautifully done cafe adorned with classic wooden decor with a huge aquarium. The cafe looks very elegant and even better when the falling lights are on during the night. There are tables that can accommodate up to ten people. The place that is really worth visiting if you want to have some really good time. The view from the place is wonderful as well. The cafe serves hookah. Some of you might face trouble in finding the place. You can spot this cafe near Pai Comforts hotel near JP Nagar Central Market. They serve Chinese and Italian cuisine. Everything served here including manchurian, noodles, chop suey, rice, pizza, pasta, sizzlers, burgers, and sandwiches are good but the must-try at this place are the french fries, Dragon And Paneer Rolls, baby corn manchurian, Ferrero Rocher smoothie. You should also try their arrabbiata chicken pasta. It is a desi and spicy version of the dish. Their Hazelnut Cappuccino in hot beverages is to die for. Check Out This Place With A Great View And Food!